Sun, sea, beach, nature, culture, friendly people, nice food, nice nightlife, draughts, … is there a better combination? Playing draughts in the morning, swimming in the sea or sitting on an elephant in the afternoon. In the evening, if you like, there are many open bars. 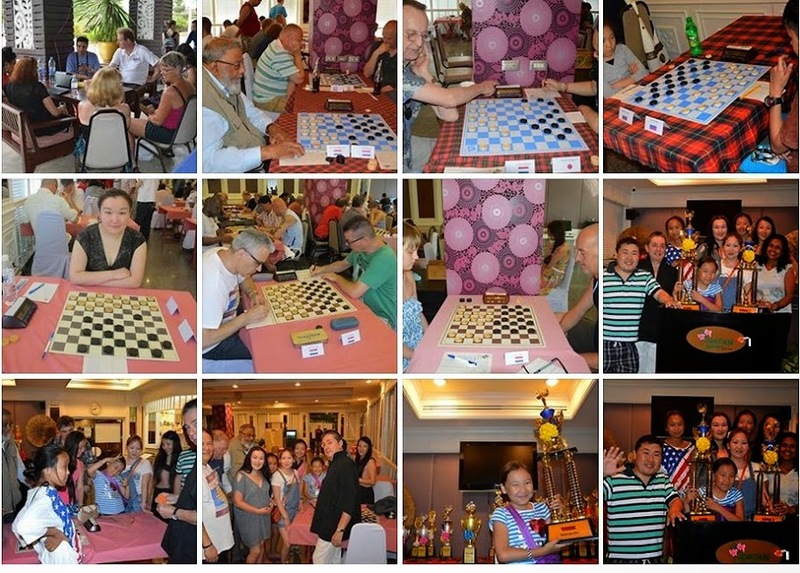 In June 2014 there will be an international draughts tournament in Jomtien, a nice tourist village just at the beach. Nine rounds in nine days according to the Swiss System and the rules of the FMJD. We will play eight games in the morning and one game in the afternoon. 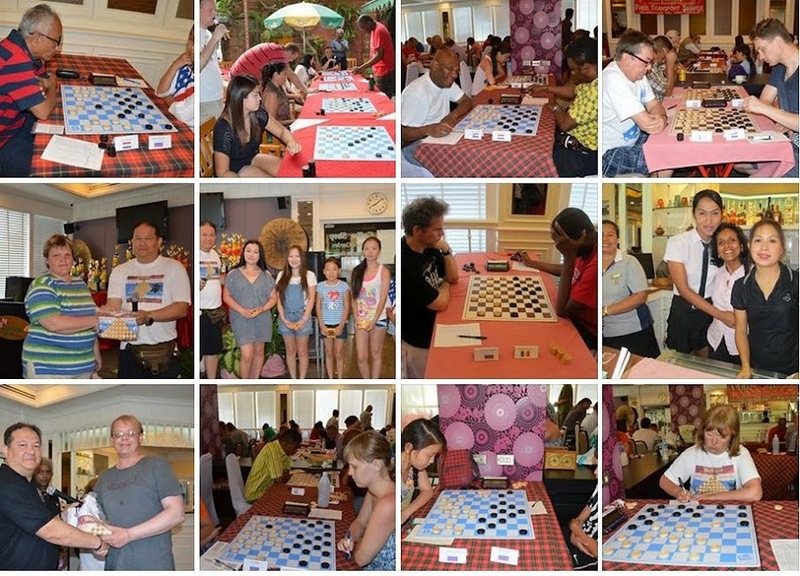 There will be enough time to take part on (of course fully voluntary) excursions, or to play rapid (‘blitz’) games, or to play a small tournament ‘Thai draughts’ with the locals. The entrance fee of the participation is 55 euro. If you want to stay in the same hotel as the tournament, the costs are app. 180 euro for 9 nights with breakfast, based on a shared room. Excursions are, of course, not included in the price. 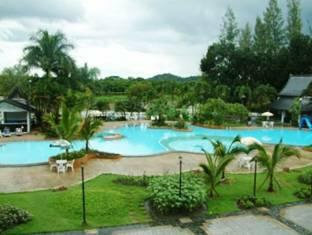 We recommend you to spend more days in the nice country of Thailand. 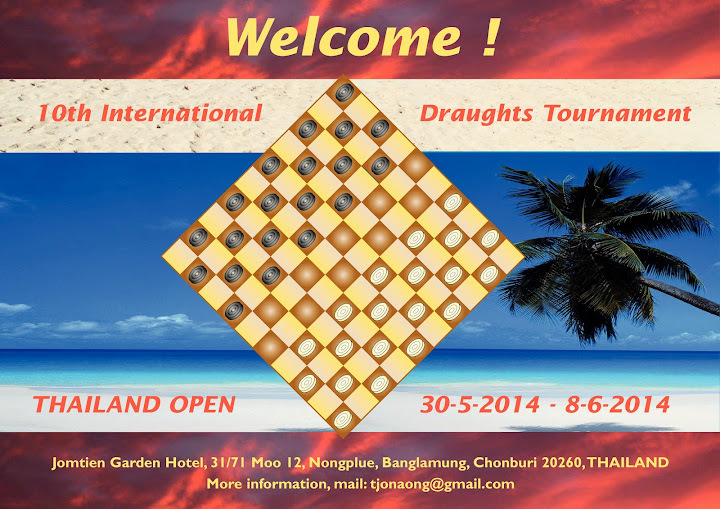 Come and join the 10th International Draughts Tournament in Jomtien (‘Thailand Open’) 30 June - 8 June 2014 in the Jomtien Garden Hotel, 31/71 Moo 12, Nongprue, Banglamoung, Chonburi 20260, THAILAND. We’ll play according the rules of the FMJD. 1.30 hours for 40 moves and after that 1.00 hour for 35 moves and after that 10 seonds/move. Swiss-system. Referee is Mr. E. Davelaar, international referee of the FMJD. There are many prizes (at least 50 prices, devided in money and cups) in several categories. It's depending on the amount of participants. There are special prizes for the best Asian players, Best Women, and Youth players if there are enough participants in these categories (>3). Do you want to join the tournament? It's not necessary to be a strong draughts player. 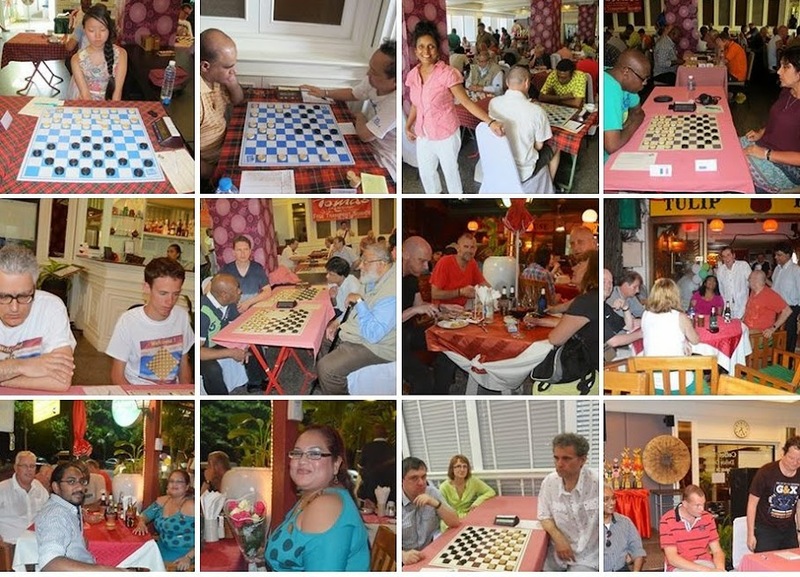 It is an open tournament for everyone who wants to play international draughts. This was the First prize for the Winner of the tournament, together with 500 euro cash. In Thailand Open 2013 we have awarded more than 100 prizes devided over all ratingcategories. Nona Savina and her daughter Evgeniya Loktionova from Russia. They both played a very strong tournament and won the main prizes in their category Women and Youth. Thailand Open champion Alexey Chizhov and the number three Yuriy Anikeev now play the World Championships in Ufa, Russia. We want to wish them a lot of success!! We hope that the new Worldchampion will participate in Thailand Open 2014! Time for an update of Thailand Open 2014. It goes well with Thailand Open. 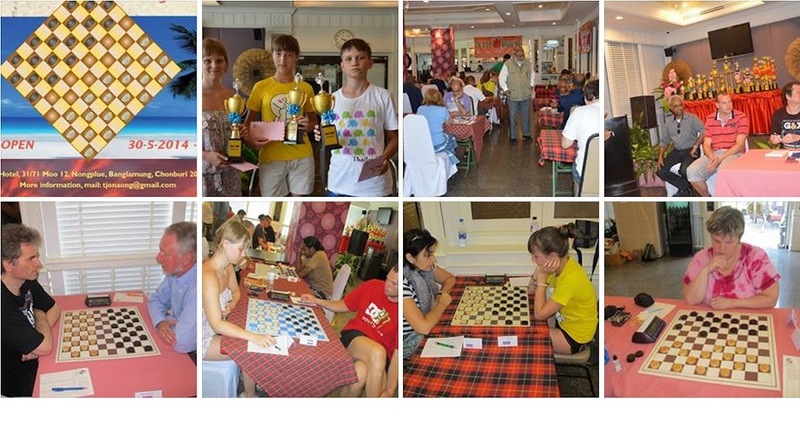 We already have lots of participants for the tournament and the tour to Dubai and Laos. Now is the best time for Registration! Just send us an email, and will send you more information and if you want, a personal invitation! We already more than 80 participants from all over the world. Make sure you also add! Don't miss this tournament! We also expect lots of more participants from China, Brasil, Russia, Mongolia and the Netherlands. This year we have a nice trip to Dubai before the Thailand Open tournament in our program and after Thailand Open tournament we will have a wonderful 11 -days trip to Laos. This trip we last made in 2010, was then a great success. We have long puzzled over whether there was an improvement somewhere in the program to make. After long studying at the previous trip we couldn’t find a single thing to improve, This Laos-trip was one of the best tours that we have ever had in our program. All 28 people who have been through the trip then, will agree that it was it was an excellent trip!! . A few highlights of this Laos trip : a two-day cruise on the 5,000 km long Mekong River , visiting the hill tribes and several other stops at villages with factories with their typical industry and crafts , the enthusiastic draughtsplayers in Luang Prabang, the Kuang Si waterfalls, the impressive procession with hundreds of monks in Luang Prabang, the breathtaking views of the mountains of northern Laos, a visit to a draughtsclub in the capital Vientiane and ended with a cozy train journey from Laos to Bangkok . At this moment, we are still awaiting the final quote from Laos . We expect that price for these Thailand / Laos tour will be just like our previous trips around 750-800 euros . (Cambodia-tour was 790 €, Malaysia-tour 865 € and Vietnam-tour 835 €) Further information will follow soon. For today there is a full excursion on our program ! After breakfast we start with a city tour and we visit the highlights of this town . First we visit the beautiful Royal Palace, the jewel of the city . It is now ( since the abolition of the monarchy in 1975 ) a museum. The main street through the center has access to dozens of streets with French monuments. One of the streets leading to Wat Xieng Thong built in 1560, perhaps the most striking temple of Luang Prabang. With graceful, layered roof, the Wat Xieng Thong is a fine example of classic local architecture. We also visit the Wat Mai. This temple owes its fame to the particular paintings that tell stories about everyday life and also the latest reincarnation of Buddha. 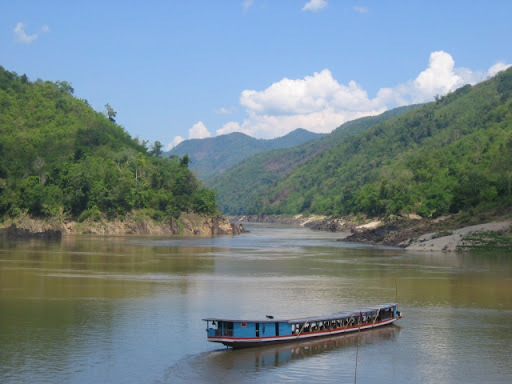 In the afternoon we go by car to Ban Xang Khong, where we will visit. one silk and paper mill. Then we return to the city and visit the oldest temple, Wat Visoen. Then we go up the mountain to the beautiful views of the mountain Phousi Hill for a beautiful sunset (B). 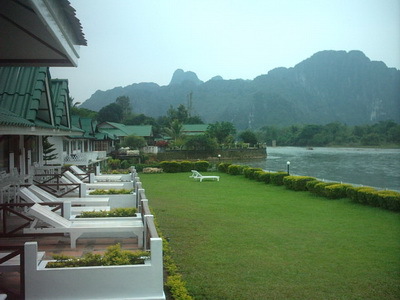 You have the whole day to explore Luang Prabang and its beautiful surroundings. 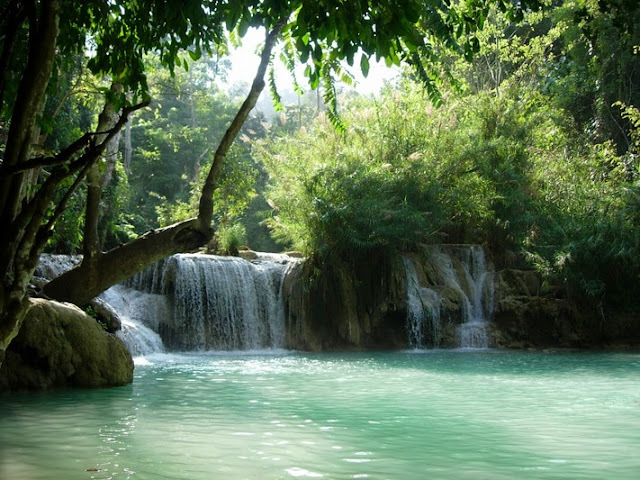 Example, you can visit the Kuang Si waterfalls by minibus , 25 kilometers outside the city . Here you can cool off in the many waterholes. The road leading to the falls , winds past expansive teak tree plantations and picturesque Hmong villages. We drive through the beautiful mountain scenery along villages where mainly live Hmong tribes. Along the way we will have the opportunity to make at ethnic minority groups such as the Yao, Hmong and Khampone. Today is another exciting excursion on the program. After breakfast we start with a city tour. With 600,000 inhabitants Vientiane is probably the most 'rural' capital in the world . The colonial history does the atmosphere of French. The delicious baguettes with pate! You should definitely try it! We will visit the Wat Sisaket, the only original temple in Vientiene. 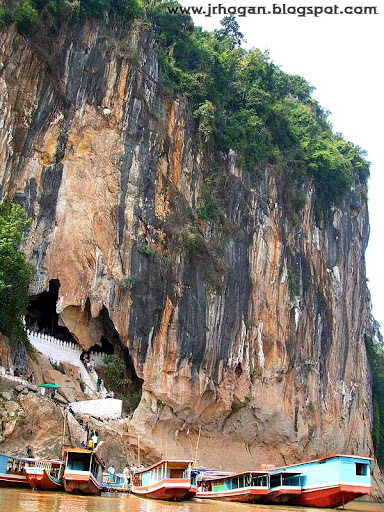 This temple was built in 1818 and is the only one that has survived the Thai invasion of 1828. Then visit Wat Phra Keo Ho, the former royal chapel where an emerald Buddha from the Lane Xangperiode is preserved. Then we visit the stupa of That Luang (built in 1565 ), the national symbol of Lao sovereignty and of the Buddhist faith. Until noon, you have every opportunity to enjoy this lively capital. The antique shops in the center of Vientiane sell beautiful carved opium pipes and silverware at a reasonable price. Later in the afternoon transfer to the border with Thailand, where we will be boarding the overnight train from Nog Khai to Bangkok. An unforgettable experience! After a good night sleep you come fitted in Bangkok for the last part of this amazing journey. Early morning arrival in Bangkok . Everyone is free to come and go where he wants. Most people will stay two or three days more in Bangkok to do the last shoppings, before the return home. Target price of the tour is pp 750 < 800. -speaking tour guide throughout the tour. We have more events on our program of Thailand Open 2014. If you want to join the Anniversary Edition of the 10th Thailand Open, and you have some more time, then you can also join our Dubai Roundtrip! For the second time in our program: the 6 day trip to Dubai /Abu Dhabi. An ideal opportunity for people who already wanted to go to Thailand and for the people who were in doubt, to go or not to go to Thailand. It is a beautiful very competitively priced stopover package. We have done our best to make this arrangement for everyone as beneficial as possible. For only 300 € you can experience it all! Flightticket for the 2 destinations from Amsterdam to Dubai (6 days stopover tour) and then to Thailand in only 598 € at this moment. In Thailand hotel costs: 18,50 € per person per day. It is your choice how many days you want to stay in Thailand. We have an excursionprogram everyday. Dubai is booming! It is the fastest growing city in the world where it is bursting with new ideas. You can see with their own eyes the most bizarre projects a reality. Dubai is one of the seven states of the United Arab Emirates on the southern coast of the Persian Gulf and lies largely in the eponymous capital exists. The people are friendly and helpful and there is something for everyone: beach, sea, lots of shopping opportunity and a vibrant nightlife. And who does not shun the adventure, can an hour away so the wilderness. About six and a half hour flight away, are the United Arab Emirates, the most famous emirate, Dubai. A fairy tale from 1001 nights, unspoiled beauty and a melting pot of Eastern and Western cultures. A very modern city with many shopping malls and low taxes makes Dubai a shopper's paradise. You will find cozy local souks (markets) and trading for golden, beautiful fabrics and electronics. Dubai is one of the safest cities in the world. You can go out until the early hours. The nightlife in Dubai is exciting to mention. There are numerous restaurants serving a variety of cuisines. Dubai has over 100 bars and pubs and there are nearly 30 modern nightclubs. Dubai is known by the super-luxurious Burj El Arab Hotel, most expensive hotel in the world. This destination has everything for a comfortable and lazy beach holiday, but is also suitable for adventurous set or sporting holiday. The Palm Islands are artificial peninsulas off the coast of Dubai in the United Arab Emirates (UAE). The project is by Mohammed bin Rashid Al Maktum, Emir of Dubai and current Prime Minister of the UAE, designed to tourism do groeien.De peninsulas have the shape of a palm tree - a trunk with many branches. Therefore, they have a very long coastline and each resident is living water. Day 01, Friday, May 23 AMSTERDAM - DUBAI. -You will fly with the ultra modern Airbus A380 (largest aircraft in the world) of The Emirates from Amsterdam to Dubai (United Arab Emirates), a modern bustling city. After arrival check into your hotel. -You arrive in the morning at the airport of Dubai. The residents of Dubai are from over 100 different countries, the differences you will notice all directly at the airport. At about 18:00 you will be picked for a Dhow Cruise (buffet & incl.diner no alc. Beverages) This romantic excursion sail by moonlight on the Dubai Creek. During this cruise with a traditional Arabic wooden ship, has an enchanting view of the Dubai skyline while enjoying a delicious dinner. The character of the city is an entanglement of modern and traditional. You'll see luxury yachts. Beautiful examples of architecture like the Dubai Creek Golf & Yacht Club and the spectacular building of the Chamber of Commerce can not pass your sight. But the old wooden dhows, the residence of Sheikh Saeed and the Heritage Village remind you of the past. Dinner and fragrant Arabic coffee are included in this excursion. Day 04, Monday, May 26, DUBAI Day at leisure! -Today you can get your last minute shopping and see what things you want to see again or not yet seen. At around 19:00 hours to the airport for the flight to Bangkok 22:35. Check out of your hotel at 12:00. If you have until 19:00 at your hotel stay, you pay a surcharge. -Arrival Bangkok at 8:00 h.
6 day Dubai / Abu-Dhabi travel for only 300, - Euro! If you want more information or you want to join this tour, please send an email to: tjonaong@gmail.com . Everyone can book on the trip! Everyone is welcome!! A High Tea in the impressive seven star hotel Burj Al Arab may actually not be missing in your trip to Dubai. The Burj Al Arab is the symbol of Dubai, known for its special shape. When you enter the hotel you will see a stunning atrium, the highest atrium in the world. The interior is inspiring and consists of many golden accents. After only two weeks, the 10Th anniversary edition of Thailand Open will start. Next Friday we will leave for the Dubai-tour, and after this tour, the International Draughts tournament, Thailand Open will begin. On this moment, we have +/- 70 participants, so we still have room for more participants. Immediately after the Thailand Open, the Asian championships will start in Bangkok. So for Asian players it is perfect to combine these two tournaments. For players of other part of the World: they can combine Thailand Open with a nice trip to Dubai or and especially the tour Laos is a must! In 11 days we will visit all the highlights of this pure and authentic Asian country. Underneath you can find an update of the list of participants. If you want to take part but you are not yet on the list, please send an email to tjonaong@gmail.com and you can still play this nice tournament. Anyone is welcome! !